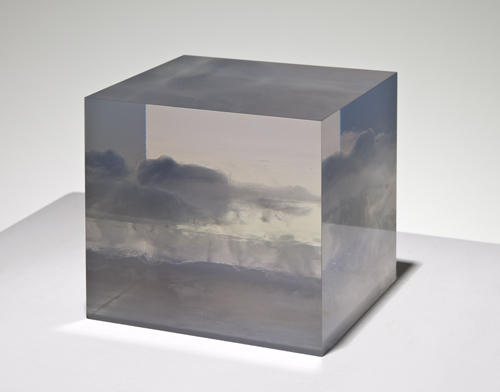 Peter Alexander, Small Cloud Box, 1966, polyester resin, 5 x 5 x 5". This fifty-year survey of Peter Alexander’s resin works demonstrates how immaculately a synthetic material can distill natural phenomena into discrete objects—tall, vertical colored wedges that fade into transparency pay homage to the lightening of deep bodies of water near the surface, while the nebulous, yellow-and-purple gradations inside a translucent cube evoke a sunset over a stormy sea, as in the aptly titled Small Cloud Box, 1966. With the show’s earliest pieces dating back to the mid-1960s, at the heart of Alexander’s special effects is the Southern California legacy of Light and Space. In the slickness and clarity of their surfaces, his simple geometric solids use reflection, iridescence, color, and distortion to radiate their own light, often in rosy shades of pink and gold. They play with our perceptions, obfuscating such basic physical properties as density and shape. The gradual thinning at the edges of simple wall-mounted works is so subtle that they appear to blur into a surreal haze, the kind that leads to a lot of squinting and eye rubbing. Two pieces, 5/6/16 (Lime Green Box), 2016, and 9/16/14 (Flo Yellow Tablet), 2014, seem to diverge from these natural references to explore newly formulated urethanes in electric colors with an uncanny ability to absorb light. This matte, opaque cube and wedge are so densely pigmented that they absorb the visibility of their own edges, and all the eye registers are blocks of color in space, geometric black holes, or creamy mint green and neon yellow. While much has changed in LA since the beginning of the artist’s career, the primordial resonance of these works, even in his oldest pieces, endures, much like with the cinematically sunny skies they've been modeled after.